Our mission at SHIFT has always been clear: to help creators make the best possible work. This means improving their workflow, enhancing their security, and giving them all their content in a central place. But let’s take a step back to the moment when a creative idea becomes reality. Every online video, TV commercial, branded spot, indie film, or blockbuster movie began as an idea that required support and resources to get from dream to screen. We asked ourselves: If we’re so committed to supporting the creative process, why not start at the very beginning? This spring we decided to answer this question and began shaping the SHIFT Creative Fund program. There were lots of factors to consider: What kind of projects should we focus on? What kind of creatives need the most support? What kind of resources can we offer a creator beyond just a grant award? There are many grants for up-and-coming filmmakers but almost none for short narrative works, so we decided to focus our attention there. For a new filmmaker still finding his or her footing, short narrative pieces are fundamental. They’re a great opportunity to be creative, to play with narrative themes, and to prepare for longer feature projects. That said, we wanted filmmakers who had completed a project or two but had yet to advance to the next stage of their creative career. We also realized that, for independent filmmakers to bring a project to life, they need more than just financial support. Filmmaking is a collaborative art form, and a filmmaker needs tools and resources beyond a budget. Drawing from our own resources and relationships in the production and ad-agency worlds, we put together a package of production and post-production resources to award the winning filmmakers. We gathered a team of consultants, experts in everything from screenwriting and sound mixing to film-festival distribution and who could mentor the winning filmmakers. Directors, TV academy members, and agency executives offered to judge the applications, while companies came forward to offer the winning filmmakers discounted gear rentals, post production and color correcting services, music licensing, and many other in-kind services. 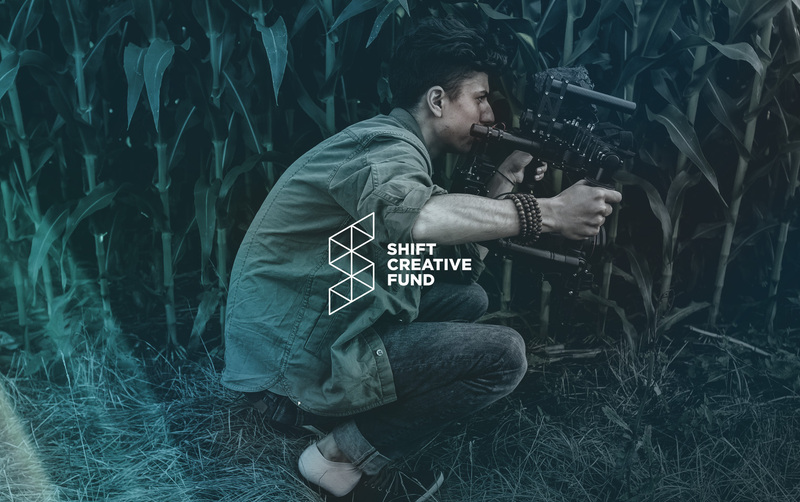 We quickly realized how passionate the entire film and production industry was about the work we were doing with the SHIFT Creative Fund. To kick off the program and get the creative process rolling, we put out a call for independent projects looking for funding to get their production off the ground. Several scripts and pitch decks came rolling in, and a small seed grant was awarded to the production team at SLMBR PRTY Films for Pioneers (working title), which tells a harrowing story of survival, courage, and female endurance in the face of hopelessness. This production was particularly exciting to us because it featured an all-female team of producers, directors, writers, and actors. Applications for the larger grant officially opened in May — we were thrilled by the response. All over the country, filmmakers of all ages, styles, and backgrounds applied. The excitement throughout the indie film community was palpable, and we were blown away by the quality of applications. They were absolutely bursting with creative energy and unique ideas that spanned every conceivable genre. For creators, the SHIFT Creative Fund is an opportunity to bring a creative vision to life; for us, it’s an opportunity to get on the ground-floor of the creative process with a new community of creators. The filmmakers we connect with today will become the big name directors, producers, and agency heads of tomorrow — an exciting prospect for everyone involved! In July, we selected three winning filmmakers, who we’ll support through 2018 as they take their projects from pre-production to final cut. We’ll share behind-the-scenes videos, photos, updates, and blog posts from each team and look forward to learning more about the creative process through the lens of these independent film productions. Yes, SHIFT is a tech company — not a production company, not a nonprofit, and not a film collective. But supporting the next generation of filmmakers gives us the opportunity to nurture a new aspect of the creative workflow while simultaneously bringing amazing stories to the screen that may otherwise not have been made. We can’t wait to see what this new venture yields and are ecstatic to share the journey (and the journey of the Creative Fund winners) with you.